College 2.0 is more than an idea—it is a tangible action plan to make college permanently affordable and accessible for all. Below is a series of documents that cover everything from the specifics of the plan, the research that informed it, the algorithm that powers it, and the guides for implementing it. Together, they provide everything needed to make College 2.0 a reality. The College 2.0 Plan outlines the basics of FICS America's groundbreaking higher education finance model. It's the place to start learning about College 2.0 and how students will thrive in its innovative new higher education environment. 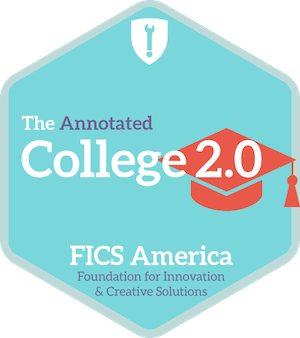 The Annotated College 2.0 Plan provides an in-depth exploration of College 2.0's evidence-based design, including citations of the more than 300 expert sources consulted in its development. College 2.0 relies on a complex algorithm that crunches hundreds of data points to ensure the financial success of participating colleges. Interested institutions may inquire about participation in the Virtual Pilot at the link below. The Institution Implementation Guide gives college leaders a clear step-by-step plan to "go 2.0," from the exploratory phase to transition to College 2.0. Some of College 2.0's most important features, including the SendSafe program and GI Bill participation, require Congressional approval. The Government Implementation Guide provides lawmakers with the information they need to empower colleges to upgrade to College 2.0's permanently affordable and accessible education.